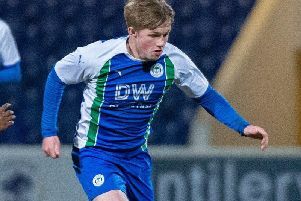 Oldham boss Richie Wellens admits his side had no answer to ‘the best player in League One’ after a masterclass from Nick Powell helped Wigan Athletic to a 3-0 win at the DW. After supplying the opening goal for Will Grigg on 40 minutes, Powell watched James Vaughan double the lead four minutes into the second half, before taking centre-stage with a glorious third goal 24 minutes from time. Even from the visiting technical area, Wellens - a fellow former Manchester United player - was able the quality that was unfolding in front of him. “I think Nick Powell’s the best player in this league,” recognised the Oldham boss. “If you give him the opportunity the shoot from the edge of the box he’s going to punish you and he did. “The difference in the two teams is, when they’ve going through a tricky spell, every single one of their players have won promotion from this league before, have won this league. “Four or five of them have won promotion from the Championship, even people that aren’t in their squad, so their budget is obviously massive. That said, Wellens had been reasonably pleased with the way things had gone prior to Wigan’s opener. “For 40 minutes, it was a very even game,” he added. “They had chances, but I thought we started really well, and then for 10 minutes they were on top. “I just wanted us to manage the game a little bit, break it up, slow it down, but then we finished the half really strongly. “We had a good chance with (Craig) Davies who’s one-on-one, and (Eoin) Doyle had a couple of chances. “But then they break away from our left-wing position to score the first goal right before half-time. “It’s a killer blow, but it’s not a blow but you can’t come back from. “The second goal absolutely kills the game off and drains a bit of life out of us, because it’s just obviously a shocking mistake. “I thought then for 15 minutes we gave it a really good go. “But this game isn’t going to determine whether we stay up or not. “It’s the Wimbledons, Blackpools, Doncasters, Southends, Gillinghams at home - they’re going to be the really important ones that will determine where we finish.